In September 2012, Stephen Few ran a dashboard design competition. The goal was to create a dashboard for a high school algebra teacher to monitor the progress of his/her students. Few provided a spreadsheet of data and a few guidelines. The winner's entry is truly outstanding. My entry is very different from that of the winner, Stephen Few's own proposal, and most other entries. I made two assumptions that explain the differences. First, I aimed at presenting the causes and consequences of the data, i.e. comparing behaviour and grades. Second, I assumed that the teacher wanted a detailed look at each student rather than an overview of his/her class. It’s about the student. This dashboard assumes that the teacher wants to identify and address issues with each individual student and find out how she can help each student learn more. This is why the foundation of the dashboard is the mini-dashboard of each student, set on an 8x4 grid. Together, the mini-dashboards take 79% of the space, leaving 16% to the class data and 5% for the identification box. The dashboard displays all the students at once because its second purpose is to direct the attention of the teacher to the students who need it most. There are visual cues that will guide her to those at risk of failing, with falling grades, far from reaching their objectives, etc. Format. While it could be displayed on a computer in SXGA resolution, this dashboard is meant to be printed on letter-size paper and distributed in the teacher’s mailbox at school. She will be able to scribble her notes and take the sheet with her to class, home, public transportation, or even to parent-teacher conferences. With paper archives in a binder, it is easy to look back at her notes to see what she made of issues when they arose. If necessary, the dashboard could be sent by email and read on a computer. 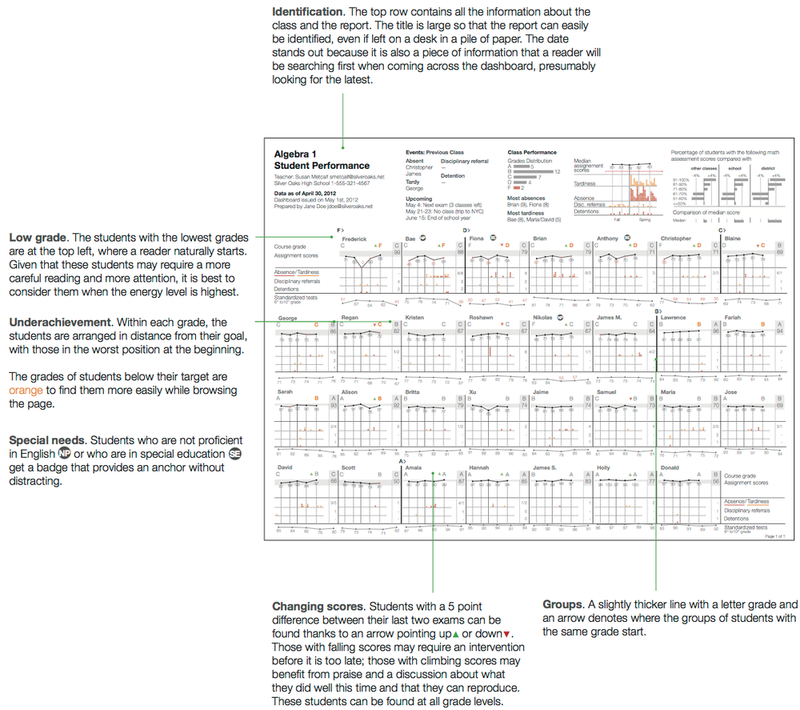 If the layout of the dashboard is meant to direct attention to the students who need it most, the individual student dashboard is meant to help the teacher understand the profile of each student, his or her behavior, aptitude and achievement, and also the magnitude, causes, and potential consequences of his or her issues. This mini-dashboard is where the attention to the individuals comes into full force. All the data is about them, without interference from class data. It is also in the details: the use of the first name only reinforces the personalization and lightens the design. The foundation of the dashboard is the timeline. It posits that events happening at about the same time can be related. It provides the context for the assignment scores, helping to identify causes for the results and even to project future results based on behavior and past results. The teacher can monitor the behaviors of the student — tardiness, absence, disciplinary referrals, and detention — against the timeline of exams. A student’s lowest grades are when he delivers his assignments on time. Could it be that he has time management issues rather than algebra problems? The teacher could talk to the student about how he goes about managing his time to complete an assignment. A student seems far below his goal, but looking at her history, she achieved a sufficient grade at least once. Was she behaving better during that period? Is there a recipe for success to be found in that period? The dashboard is set up to capture a full year of data to give a better idea of the strength of the causal relationship between behaviors and achievement. Assumptions were made as to the date of the assignments, that of the behaviors during the fall term, and which assignments were late. The top row captures the class dynamics. A group of students, along with their teachers, establish relationships that can influence individual behaviors. Perhaps high performing students can inspire some student, or talented students might drift into laziness in a class with prevalent misbehavior. The middle of the top row provides information on some pressing issues that could direct the attention of the teacher to certain students in ways that complement the mini-dashboards.This section and the last provide comparators to assess how the class is performing as a whole and against its peers.